The Internet of things (IOT) will utilize the existing networking infrastructure, technologies and protocols currently used in homes/offices and on the Internet, and will introduce many more. The purpose of this tutorial is to give you a quick overview of what networking and application protocols are likely to be used to build the IOT. Note: You should have a understanding of basic Networking and Networking technologies before you continue. The IOT will run over the existing TCP/IP network. The existing TCP/IP networking model uses a 4 layer model with protocols def ined at each level. See understanding the TCP/IP 4 layer model. 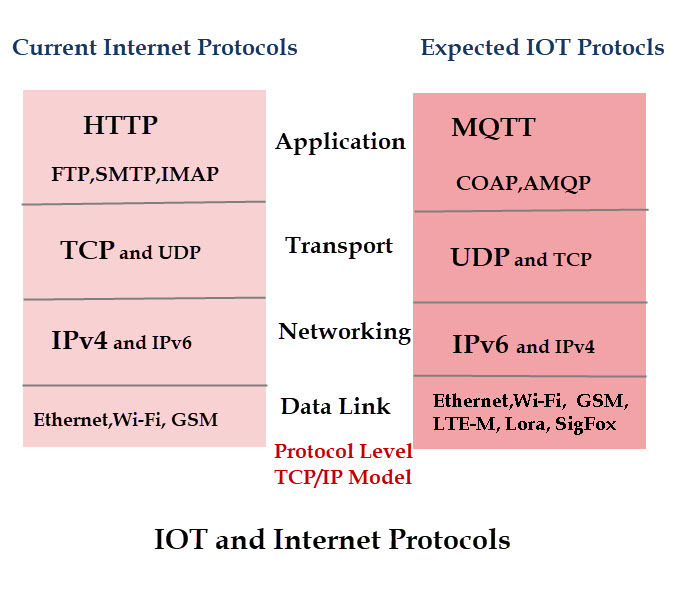 The diagram below shows a side by side comparison of the Internet protocols currently in use and those that are likely to be used for the IOT. 1. I have used larger font sizes to depict the protocol popularity. For example IPv4 is larger on the left as it is far more popular on the current Internet. However on the right it is smaller as IPv6 is expected to be more popular in the IOT. 2. Not all protocols are shown. 3. The areas that are showing the greatest activity are the datalink (levels 1and 2) and application layer (level 4). 4. The network and transport layers are likely to remain unaltered. At this layer you will have a requirement to connect devices that are nearby e.g. on Local networks, and that are more distant e.g. Metropolitan and wide area networks. Current computer networks use Ethernet and Wi-Fi at this level for home/office networking (LANs) and 3G/4G for Mobile connections (WANs). However many IOT devices, like sensors, will be low powered (battery only). Ethernet isn’t suitable for these applications but low powered W-fi and low powered Bluetooth are. Although existing wireless technologies (Wi-Fi, Bluetooth,3G/4G) will be used to connect these devices, other newer wireless technology, especially designed for IOT applications, will also need to be considered, and will likely grow in importance. The protocol that is set to dominate at the networking level in the long term is IPv6. It is very unlikely that IPv4 will be used, but it may play a role in the initial stages. For example, most Home IOT devices e.g smart lights currently use IPv4. At the transport level TCP has dominated the Internet and the web. It is used by HTTP and many other popular Internet protocols (SMTP, POP3, IMAP4 etc). MQTT which I expect to be one of the dominant messaging application protocols currently using TCP and is already deployed. However because of the requirement for low protocol overhead I would expect UDP to feature much more in the future IOTs. MQTT-SN –which runs over UDP is likely to see more widespread use in the future. HTTP is probably the best known protocol at this level as it it the protocol that powers the Web (WWW). HTTP is also going to be important to the Internet of things as it is used for REST APIs which are becoming the main mechanism for Web Applications and services to communicate. However because of the high protocol overhead HTTP is not likely to be a major IOT protocol, but will still enjoy widespread usage on the Internet. See MQTT vs HTTP for IOT. IMO Machine to Machine (M2M) Messaging will probably become the Email of the IOT world. There are several messaging protocols currently in use. Many where designed and developed before the IOTs became a buzzword. However some messaging protocols e.g. COAP have been developed for the IOTs. Which of these protocols will dominate is unsure, but because of the very many different requirements of Internet connected devices there will be more than one. AMQP -( Advanced Message Queuing Protocol) Uses TCP/IP. Publish subscribe model and Point to Point . This article covers the main protocols and their main uses. The conclusion of this articles seems to be that the IOT will consist of a collection of protocols depending on their intended use. However if you look back to the early days of the Internet HTTP was just one of many protocols, but it has become the dominant one. Even though HTPP wasn’t designed for file transfer it is used for file transfer. It wasn’t designed for email either, but it is used for email. IMO IOT messaging protocols will follow a similar pattern with most of the services using 1 dominant protocol. Below are the Google trend charts showing how the popularity of MQTT, COAP and AMQP has changed over the last few years. For 2017 the interest in MQTT has remained extremely high. For 2017 the interest in AMQP has remained high. The areas that are showing the greatest activity are the datalink (levels 1and 2) and application layer (level 4). The network and transport layers are likely to remain unaltered. At the Application level messaging protocols will be used for Interconnecting IOT components. Although we are still in the early stages of IOT adoption it is likely that the Industry will consolidate around 1 or possibly 2 messaging protocols. Over the last few years MQTT has emerged as the most popular, and is the one I’m currently focusing on on this site. What’s the Right Messaging Standard for the IoT? Great information on IOT protocols. I always refer and recommend this site to everyone when it is related to networking concepts. looking forward to more articles like this. Cheers to the author. Hi Steve, Do you have any experience in using AMQP over 4G/3G? I have not been able to get any communications between a Raspberry Pi and a cloud base RabbitMQ instance using AMQP, whereas if I use MQTT it works perfectly. I have done hundreds of tests with various devices using WiFi, Hard-wired Ethernet and 4G/3G. My application, when using AMQP works over WiFi, and hard-wired ethernet but not over 4G/3G. When using MQTT, my application works over all three without problems. I have not found a single instance on the web of anyone using AMQP over 4G/3G! Sorry but I have never used AMQP.